Myntra, India’s leading online fashion portal, is bringing its flagship End of Reason Sale once again starting January 3, 2017. This is the fifth edition of the landmark sale. It lasts up to January 5, 2017. Just when you think all the festivals and celebrations are over with the year coming to a close, the Myntra sale, coming as it does at the start of a new year, brings a whiff of hope and excitement with it. 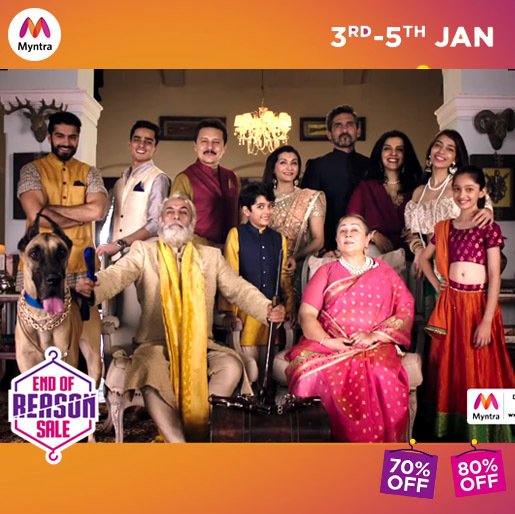 What’s more, the sale promises to deliver everything your heart desires with its tagline: “Jo chaho milega, jab Myntra ka sale khulega” (meaning whatever you want you can have, when the Myntra sale opens). Around 1800 top Indian and international brands with their latest winter collections are part of the sale, which expects about 10 million-plus customers to come online to shop and create a new wardrobe for the New Year. To participate, customers of Myntra can shop through the Myntra mobile app, the Myntra mobile website and the Myntra website on the desktop. Last year’s sale, the fourth edition of EORS, had helped Myntra log over two million item orders at the conclusion of the first day of a two-day sale. In the run-up to the opening of the sale last year, Rs 700 crore worth of products were added to the EORS wishlist. The wishlist is a special feature associated with the event. Potential customers have to hurry up and fill their wishlist with their favourite styles, so they don’t miss any extra offers. One can expect up to 80% discount on the largest range of fashion clothing. An extra 5% discount can be availed on every purchase if a customer pays with a Myntra gift card. Myntra has also introduced gamification during the EORS sale. The game, available on the Myntra app, allows one to play, accumulate points, and win early access to the sale. There are many other innovative activities, like the Mannequin Challenge, which can be used to uncover the prices of products. By now, most people must have spotted the Myntra ad at least once. The ad features both P V Sindhu and Hrithik Roshan. While the Olympic champion and ace shuttler is seen tackling two players across the net even as she prefers to browse through he Myntra App, the Bollywood star is seen in his branded clothing lien HRX, jogging and giving a shoutout about the sale dates. The 35-second ad tells shoppers to get ready for the ultimate sale. It encapsulates the secret fashion desires of people, and helps to build excitement. The commercial can be spotted on top TV Channels, while the marketing campaign for the sale is spread across print, radio, digital and social media. On the digital front,, besides the game, Twitter has seen Indian off-spinner R Ashwin doing his bit for the sale.